The support requires no adhesive/cement. It locates within the holes “DRY”. 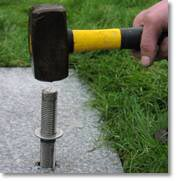 This enables the simple removal and refixing of the memorial and foundation. The support can also be removed and re-used as required. 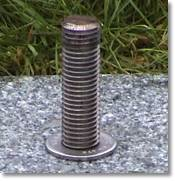 BASE = Single 28mm dia. hole. Centrally positioned side to side, underneath the memorial plate. in effect a third dowel. 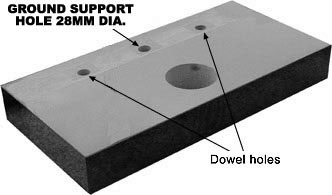 FOUNDATION= Single 28mm dia. hole. Centrally positioned side to side, corresponding to the base anchor hole, when correctly aligned, from front to rear. These instructions serve as a suggestion only. Every mason will utilize their own methods. the ground support is designed to be ADJUSTABLE, ADAPTABLE and when bolted fixing, to avoid the complete lift of the memorial. Once the foundation is in place; spin the washer onto the support rod to the required position. (i.e; the thickness of the base). Drive the support rod into the ground through the pre-set hole in the foundation until the washer meets the foundation top. ensure that the distance from the washer to the end of the support rod is not more than the base thickness. Position the base over anchor. Cement base to foundation and remove skids. Cover the base support hole with waterproof tape to stop any adhesive entering and continue to fix the plate as normal.